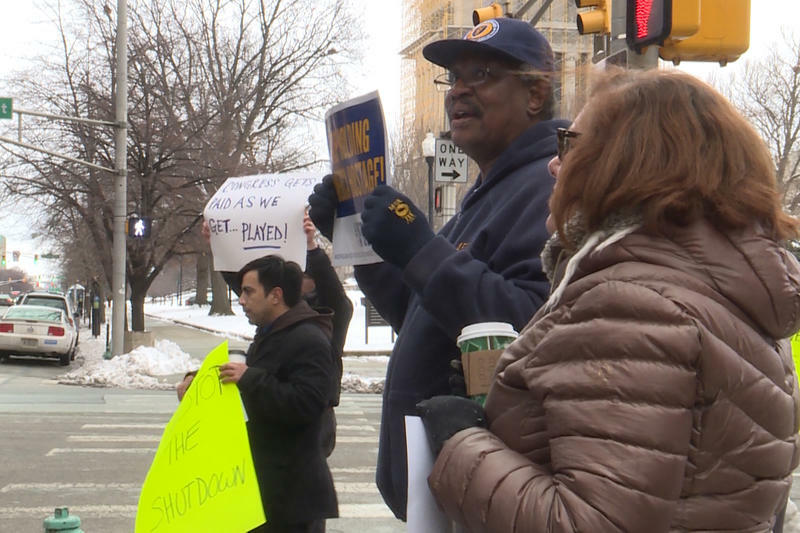 A small group of federal employee union members gathered outside of the Birch Bayh Federal building in Indianapolis Wednesday. They organized to protest, and call for an end to, the partial government shutdown. Members of the American Federation of Government Employees, the country’s largest federal employee union, say it’s unfair members of Congress get paid while they struggle to support their families. Renea McCammon works for the Transportation Security Administration, the TSA. She says she hopes to send a message to federal lawmakers. “Even the people here in Indiana are willing to stand out here, in the freezing cold, to say that the government needs to open back up,” McCammon says. A retired Defense Finance and Accounting Service employee, Frank Rock, says the situation is shameful. “It is wrong to force an employee, who wants to work, who has loyalty to their government, forcing them to work without pay,” Rock says. Both the U.S. House and Senate have passed a bill that would pay federal employees backpay from the shutdown. The president has indicated he would sign it once the government re-opens.